Conscious style in the Bahamas! Happy Friday, guys! It's been a while since I last posted on the blog. July has been a little hectic with this Bahamas trip to promote an eco-friendly hotel (will be on the blog this weekend), and Swim Week currently taking place in Miami. Can you believe there are 5 sustainable and fair-trade brands hitting the runways during Swim Week?! I'll be covering the events on my social media channels and will share every detail with you on the blog next week! Thus, make sure you're following me on snapchat (waterthruskin) and IG (@waterthruskin) to stay up to date with everything. In the meantime, let's talk about this look. Head-to-toe fashion with a purpose! Another example that change is in the little steps and those steps can look fabulous! Beyond Skin Floral Espadrilles: Perfect for summer! These vegan flats are handmade in Spain from recycled PU and plant-based top coats. Their linings are also 100% recycled with vegetable coating. 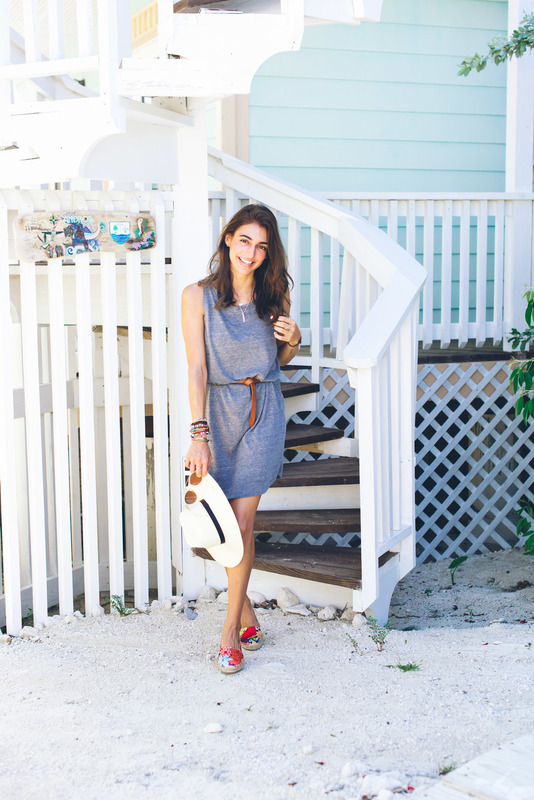 My favorite espadrilles ever! Grey dress by Alternative Apparel: Super comfortable and can be worn with anything! It's made from natural fibers using processes that have nature and humanity in mind. You can get yours at Nomad Tribe in Miami and online. Use code WTS15 for a 15%discount! Sunnies by Westward Leaning: made from natural materials benefiting different charities. Panama Hat by Artesano: helps build homes for people in need in Ecuador.